Urothelial cancer of the urinary tract is common and affects a large number of men and women, result- ing in a reasonably large part of the work effort of urologists who take care of adults. Most of the urothe- lial tumors arise in the bladder but the same causative factors can lead similar tumors of the upper urinary tract and prostatic urethra. Due to the heterogeneous nature of these tumors as well as their propensity for “recurring” in time and location over the patient’s life the clinician is often in the position of decid- ing among often challenging treatment choices for his/her patient. Although there are published guide- lines many cases do not readily fit into a typical scenario, thus leaving ample room for decision mak- ing for the individual patient. We invite our readers to review and comment on the case and management by using the comment section below each case. L.R. is a healthy appearing 83 year old woman that presented to a urologist upon referral from her primary care physician with a 6 month history of recurrent urinary tract infections and more recently some right flank discomfort. A CT scan of the abdomen and pelvis revealed moderate right hydronephrosis with a point of obstruction near or at the bladder. The left upper tract was normal. Images of the bladder indicated masses consistent with bladder cancer. This is a healthy appearing 77 year old man with bladder cancer. He presented in April 2016 with an episode of gross hematuria. He lives in Central America and was seen by a urologist there. His past medical history is uneventful. He has adult onset type 2 diabetes and takes metformin. He was never a cigarette smoker. The only surgery he had was a right inguinal hernia repair. He is not overweight. MG is a 75 year old man who presented with a single episode of gross hematuria in October 2017. He is overweight and has insulin dependent diabetes mellitus. He has some lower urinary tract voiding symptoms. These consist of nocturia twice and some daytime frequency. His urinary stream is slow. Low-grade bladder tumors are almost always confined to the urothelial surface. They are arguably the most common urothelial tumor in the urinary tract. The current grading system uses low and high grade instead of the now historical 1–3 grading system. Low-grade tumors include not only those that were previously called grade 1 but also some of the grade 2 tumors. Approximately 80 per cent of patients who have a urothelial tumor of the bladder have a low or high grade papillary tumor which is non invasive (Ta) or is high grade papillary or sessile and invades the lamina propria (T1). The initial presentation is most commonly gross hematuria, which promptly leads to outpatient endoscopy and a subsequent transurethral resection (TUR BT). R.F. is a healthy appearing 55 year old man who had gross hematuria February 2016. His past medical history is negative with the exception of a 15 pack/year history of cigarette smoking. He had a normal CT scan with the exception of a bladder tumor located in the posterior wall of the bladder. He underwent an uneventful transurethral resection of a papillary bladder tumor in March 2016 at another medical center. He received a single postoperative dose of intravesical mitomycin C 40 mg in 40 ml in the recovery room. JP is currently a 58 year old man with multifocal urothelial tumors of the urinary bladder despite two courses of intravesical mitomycin C and one six week course of BCG. The patient appears well but has a significant past medical history consisting of diabetes mellitus, coronary artery disease, mild congestive heart failure, chronic renal disease, and peripheral neuropathy. He stopped cigarette smoking at age 35 after 15 years of smoking 1.5 packs/day. He has had a coronary artery stent placed. 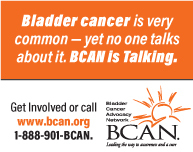 S.C. is a 71 year old man with a new diagnosis of prostate and bladder cancer. This man has been in excellent health and was a long time marathon runner. His only past medical history was of a left inguinal hernia repair. He was a former cigarette smoker with a 10 pack year history. He did not have any voiding complaints. He had been taking dutasteride for LUTS. 72 year old woman who had one episode of gross hematuria and saw a urologist for an investigation. Her general health is good. The only prior surgery was a cholecystectomy. She smoked cigarettes for 15 years – one pack/day. She stopped 30 years ago. A 61 year old previously healthy man had gross hematuria and was found to have a muscle invasive urothelial cancer of the bladder. The clinical stage was T2 and there was lymphovascular invasion. The patient is a 56 year old male practicing urologist. He had the acute onset of gross hematuria and a CT scan of the abdomen and pelvis was normal except for a possible small bladder tumor. An office cystoscopy indicated a solitary 3 cm papillary tumor at the right lateral wall. A TURBT was performed and the pathology revealed a high-grade focally invasive T1 urothelial carcinoma. Muscle was present and not involved. There was a focus of CIS adjacent to the tumor. The rest of the bladder and the prostatic urethra were visually normal but not biopsied.